May Day is Lei Day in Hawaii. 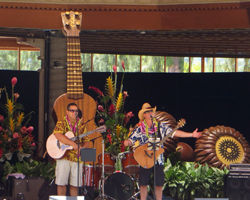 Enjoy free Waikiki entertainment and more. May Day is Lei Day in Waikiki! Adding uniquely Hawaiian fragrance to the traditional spring holiday, May Day is Lei Day in Hawaii. And you’re invited to join the festivities at Kapiolani Park on the edge Waikiki. 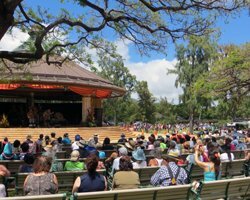 The holiday is celebrated with a free Hawaii festival at the foot of Diamond Head and various other commemorations. You can enjoy live Waikiki entertainment, tasty Hawaiian treats, artisan crafts, and of course… those sweet-smelling floral garlands called lei. By the way… the giving and wearing of leis isn’t limited to the May 1st “Lei Day”. Almost every occasion can be appropriately commemorated with one of these traditional Hawaiian garlands – except for local graduations… those usually require dozens to possibly hundreds of leis per graduate! I’m not exaggerating. Leis are considered to be a very classy and uniquely Hawaiian gift/accessory, and they come in dozens of styles – some of which are incredibly elaborate and beautiful. Better still (in my opinion) you can now order them online, which saves the time and hassle of running around looking for just the right style: Shop for Leis (link opens a new window/tab). Designating a special day dedicated to the uniqueness of Hawaii culture was the brainchild of two local writers who conceptualized the holiday based on the popular tradition of making and wearing lei. In 1928, the idea was proposed in the local newspaper and scheduled for May first (in conjunction with May Day). The idea was so popularly received that in 1929, Lei Day was named an official Hawaii holiday! Although not necessarily a major holiday (we don’t get the day off from work or school), it is still commemorated every year. People give one another lei. 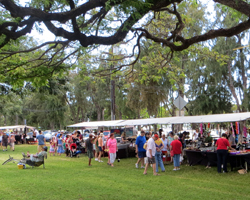 There’s the annual festival at Kapiolani Park. And many elementary schools put-on some sort of program for the parents. Inauguration ceremony for the Lei Queen and Court. Lei making, lauhala weaving, and hula lessons. Then on the next day, lei from the contest are draped at Mauna Ala and Lunalilo’s Tomb at Kawaiahao Church. 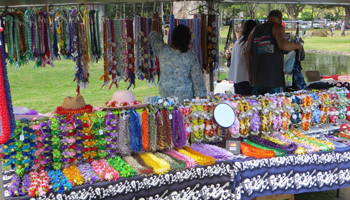 For this year’s exact schedule of events, go to the City and County of Honolulu event calendar and click on the May 1 link to Lei Day Celebration.